The Chief of Army Staff, Lt. Gen. Tukur Yusuf Buratai, has expressed his immense appreciation to Governor Ifeanyi Ugwuanyi of Enugu State, for the support his administration has been giving to the 82 Division of the Nigerian Army, in securing both the state and its neighbors. The Army Chief’s message of appreciation was conveyed to Gov. Ugwuanyi by the new General Officer Commanding 82 Division, Nigerian Army, Maj. Gen. Emmanuel Boman Kabuk, when he paid a courtesy visit to the governor at the Government House. “Your Excellency, I must quickly add that the Chief of Army Staff, Lt. Gen. Tukur Yusuf Buratai is highly appreciative of the support that you have been giving 82 Division. Some of the supports that you have given 82 Division had spilled over in ensuring security in neigbgouring states”, the new GOC said. Maj. Gen. Kabuk appreciated Gov. Ugwuanyi for entrusting Enugu State to the hands of God, which he said, was responsible for the existing peace and security in the state, stressing that “there is peace in Enugu State because whatever a man places in the hands of God, no man can tamper with it”. 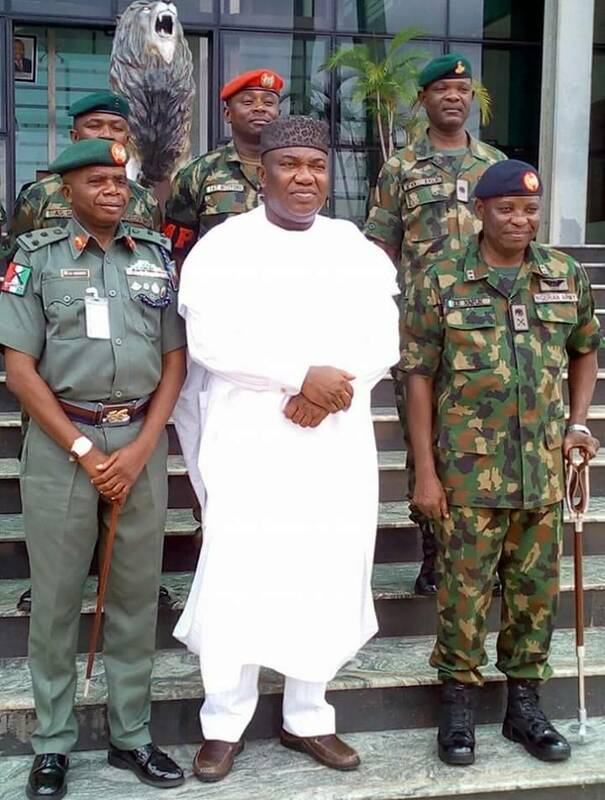 He stated that Enugu will continue to enjoy peace “because you (Ugwuanyi) have handed over Enugu State into the hands of God”, adding that the existing peace in the state has added value to the Division’s security operations in all the states within its command. The new GOC, who further appreciated Gov. Ugwuanyi for his contributions towards the successes recorded by the Division during the leadership of the immediate past GOC, Maj. Gen. Adamu Abubakar, also expressed confidence that the governor will continue to give him the support “even more than my predecessor had enjoyed from you”. He maintained that the military will forever remain grateful and remember Gov. Ugwuanyi for the water project recently built in the barrack that now supplies water to the area and its neighbouring communities; the roads his administration constructed for the military in the 103 Battalion “and the one leading to the water project” and the NOAWA pet project for the wives of fallen heroes, among others. Maj. Gen. Kabuk equally expressed delight at the governor’s popularity and closeness to the people of the state as well as the overwhelming support and solidarity he enjoys from them, disclosing: “I have also heard Enugu people saying that their governor is the best governor in Africa”. “I saw it Your Excellency, when the Vice President, Prof. Yemi Osinbajo visited. I saw the enthusiasm with which your people were rallying around you and, your security could not stop anybody from getting very close to you, which means that your people is your own security. “That is what it should be in every level of leadership. The people are the security of the leaders. I want to encourage Your Excellency to maintain this level of cordiality with your people”, he added. The GOC therefore, assured the governor of his commitment to discharge his responsibilities professionally, promising to be responsive and act within the ambit of law. In his address, Gov. Ugwuanyi, who delightfully welcomed the new GOC to Enugu, also congratulated him for his “posting to this very strategic office”. The governor stated that the Maj. Gen. Kabuk’s new assignment was an eloquent attestation of the trust and confidence the Nigerian Army’s hierarchy reposed in him. The governor assured the new GOC of his administration’s highest regards, goodwill and friendship. In his words: “I wish to assure you of our commitment to strengthening this relationship and to continue providing necessary assistance and support to the Division towards the successful discharge of its duties. “I use this forum also to restate our unrelenting prayers, support and solidarity with the Nigerian Army and the Armed Forces of this country as a whole, in their current efforts to make the country a safer and more peaceful place for all. “As a government, we have always maintained and enjoyed a cordial working relationship with your Division and indeed the Nigerian Army as an establishment.